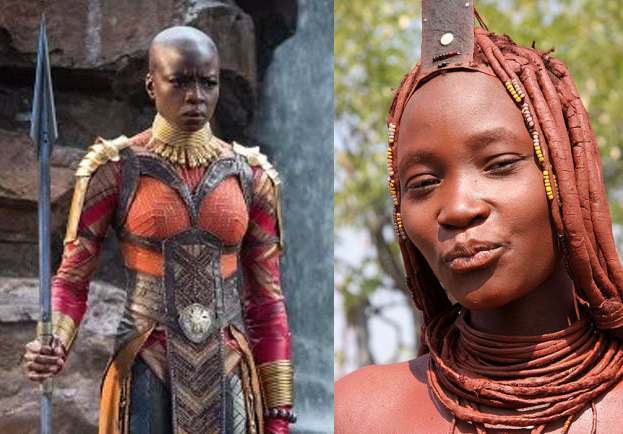 Find out the biggest African influences on the look of Black Panther movie. In a few weeks, Black Panther movie opens. It looks like no other movie ever made. Part of that is from the costume design that celebrates Africa without falling on traditional tropes. Gone are the animal skins and loincloths. Designs and styles that reflect all of Africa replace them. They're from all over the continent and not just the Southern or Nothern regions. The one who created the incredible costumes for this movie is Academy Award-nominated film designer Ruth E. Carter. To create this look costume designer Carter looked across the continent to pull designs from many tribes and people. She fused them together and created something new. While Carter didn't draw inspiration from one a single tribe or group there are certain tribes that were obviously more influential than others. In this post, I'll try and share the context and history of her most prominent influences. You'll be able to appreciate the incredible amount of work and history that helps create this film. 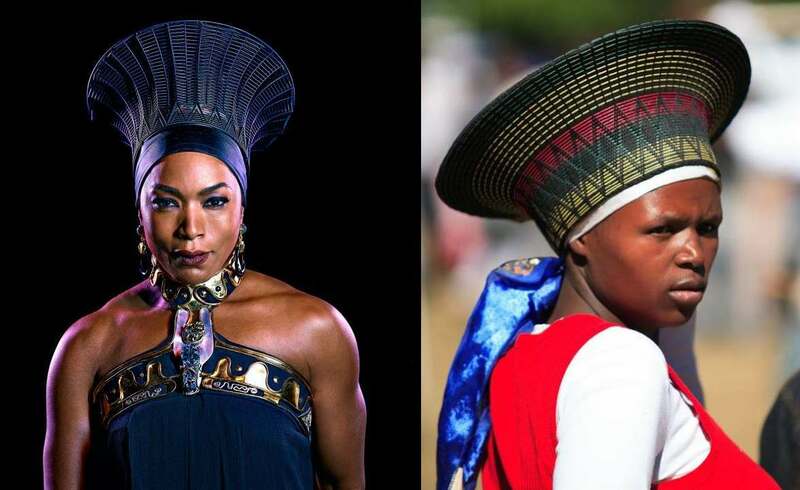 Angela Bassett plays Queen Ramonda and wears a distinct headdress. It's reminiscent of the reed Zulu flared hats or "Isicholos". They originated from the South African Zulu nation in the Kwazulu Natal stronghold. The Zulu headdresses are traditionally worn by married women for ceremonial celebrations. Today, this type of hat has been adopted as part of "traditional" Zulu dress ensembles and is worn almost exclusively during ceremonial events and pageants. "For Ramonda, the queen [played by Angela Bassett], we were inspired by modern fashion, some of the fashion designers that are really way out there like Gareth Pugh and Rick Owens and we looked at some of the shapes they had in fashion," Carter told MIC. "We didn't want it to be futuristic, per say, but there's something really regal about some of these shapes." 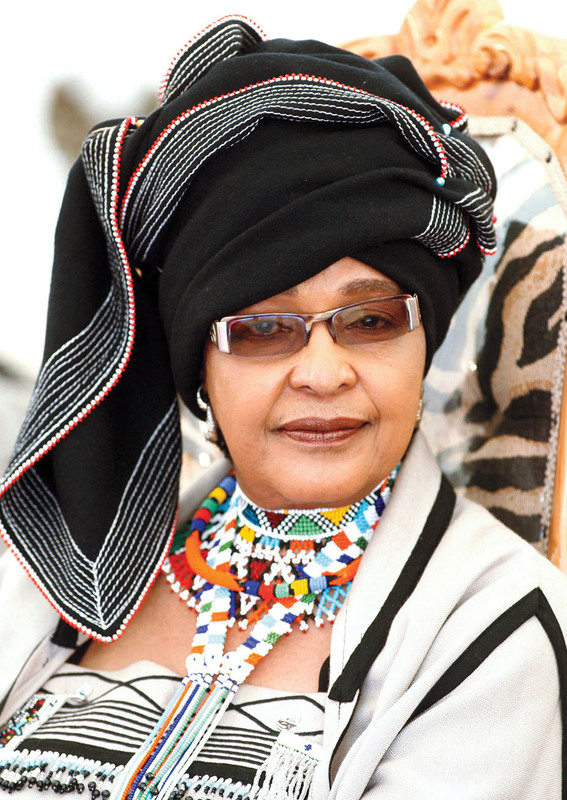 "I had a video of her arriving at a birthday party in South Africa wearing a traditional Zulu woman's ceremonial costume and headdress that was just beautiful," she says. "As a futuristic nod, she wears a shoulder piece made from African lace designed in a circuit pattern and 3D-printed." 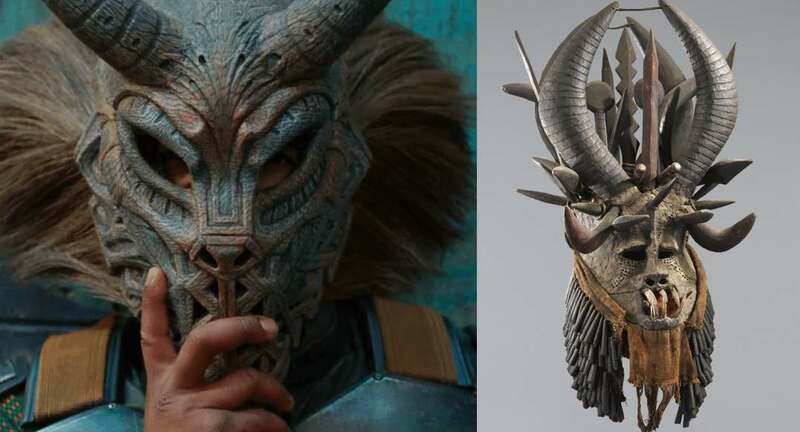 Says director Ryan Coogler, "Ruth and her team paid respect to specific tribal inspirations that we came up with while creating a look that was entirely unique." Many of the costumes have unique and futuristic ornamentation and details. These were made by emulating styles of the Masai people. The Maasai people of East Africa live in southern Kenya and northern Tanzania. The arid and semi-area area known as the Great Rift Valley. "I looked at a lot of traditional, ancient African people in different regions," Carter told Mic. 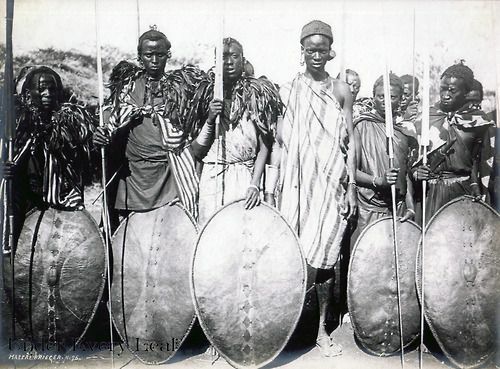 "The Masai tribe, and what they looked like, their ancient costumes. A lot of it has a futuristic edge. So with the aid of 3D printing, we were able to take ancient African tribal costumes, combine them with 3D printing and create something inspired by but also unique to Wakanda." Many of the costumes have a distinctive red earthy tone. This was done by studying the colors used by the Himba people of north-western Namibia. They mainly live in the land bordered by Angola to the north and the Skeleton Coast and the Atlantic Ocean to the west. "I looked at the Himba tribe with that red clay," Carter again told Mic. "I saw exactly what that color looks like and I could use that color in the work that I was doing." The Himba are known for applying a red ochre paste, known as "otjize", to their skin. It's made by pounding the ochre stone (Hematite) into small pieces. The pieces are mixed with butter, slightly heated by means of smoke and applied to the skin. It has a practical purpose since it cleanses the skin without water and also provides some protection from insects and the sun. It's not that the Himba people don't bathe but water is scarce and this provides some help during droughts. In one scene one of the elders of the tubes of Wakanda, played by Isaach De Bankole, is wearing a tailored blue suit and a lip plate. While many cultures use them they're best known by the Surma and Mursi tribes in Ethiopia. 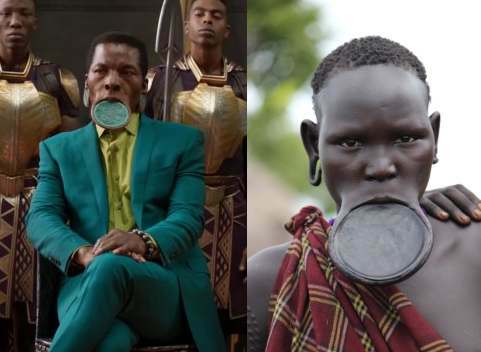 Traditionally women wear the lip plates but Wakanda has men and women wearing them. That's progress. In one scene Erik Killmonger wears a mask in the style of the several people. The most prominent design inspiration is the masculine and aggressive masks of the Igbo people of Nigeria. The masks, known as Mgbedike, are distinguished by the large size and bold masculine features. They are used in Igbo rituals and are designed to contrast the female dancers with their more feminine beauty. "I had never done a Marvel film, a superhero film, so I didn't quite know what to expect," Carter said. "I was hired because I could bring some intellect and creativity to the table, and they supported me 150%. It costs a lot of money to do costumes for a film like this. It killed me. I worked ‘round the clock, because I had costumes being made in Korea. And then I had shoppers that were going to Nairobi and South Africa. I had a shopper in Uganda." All that work and research paid off. 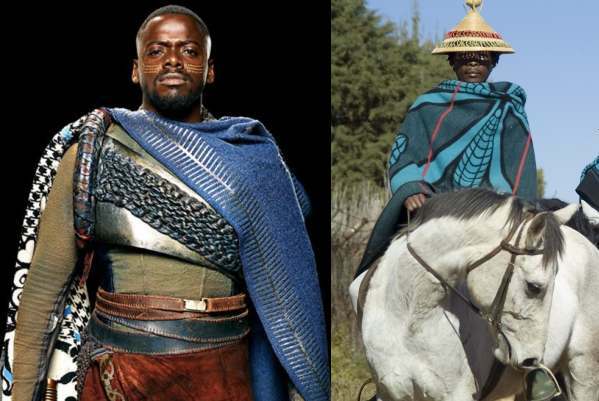 In several scenes, W'Kabi (Daniel Kaluuya) and others are shown wearing Basotho blankets around their necks. Though the blankets are originally from the Lesotho people the designs are synonymous with the Sesotho people. The Basothos are a Bantu-speaking people of Lesotho who are often referred to as "The Kingdom in the Sky" or "The Switzerland of southern Africa" because of the rugged mountainous terrain. No matter what the season, both men and women wear the wool Basotho blanket as a cloak. It's the careful selection of color and pattern that allows for individual expression. I would love to see these elegant cloaks take off in New York or Colorado after the movie comes out. Stylish. 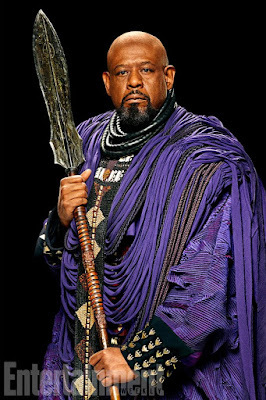 Forest Whittaker plays shaman Zuri who's the spiritual leader of Wakanda. He wears ornate flowing robes known as an Agbada. It's one of the names for a flowing wide-sleeved robe worn by men in much of West Africa, and North Africa. 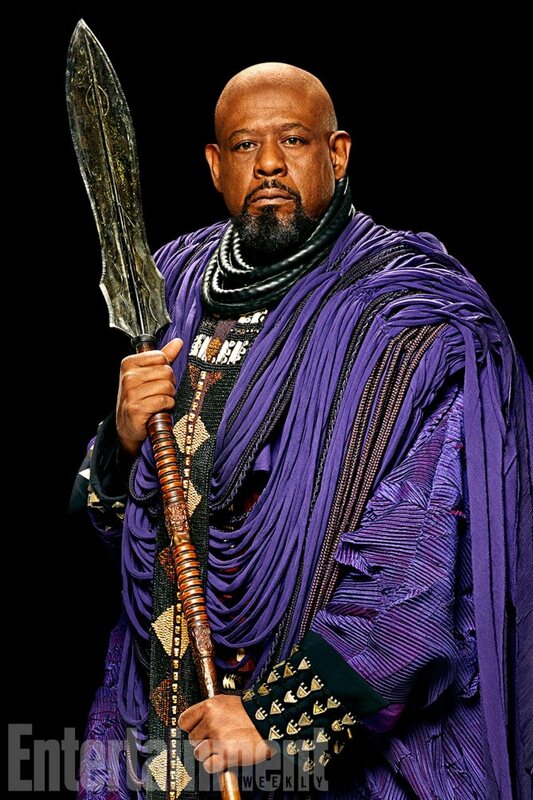 "Creating this look for Forest Whitaker was not simple," Carter said on her blog. "Modeled after the 'Agbada' found amongst the Yoruba of Southwestern Nigeria and the Republic of Benin, West Africa, this garment consisted of four layers: Awosake, Awotele, Sokoto, and an Accent layer. "1. The top layer, the 'awosoke' consist of 200 silk tubes joined together in a successive order that allowed it to have this orderly yet free-flowing drape. I mixed in rope that was dyed to match to give it dimension. It was crafted by a seamstress sewing together 2″ silk bias strips for 4 days. I worked with her on her table every day laying out the order of the tubular shapes and mixing in the dyed rope to create the perfect combinations and lengths. It was made similar to a poncho. We repeatedly put it on the form to examined it. This resulted in adding more loose silk strips down the back of the garment to allow it have movement and to blow. "2. The next layer is the undercoat, calling it the 'awotele'. It too is made of silk and was pressed in pleats in the [ Japanese fashion designer] Issey Miyaki style. Underneath that coat, he is wearing a lightweight black tunic with long sleeves and large cuffs. The black cuffs can be seen on the outside of the coat. I then used small silver metals made by the Tuareg people of the Sahara desert. Using Tuareg pieces highlighted their intricate use of design in their silversmithing. Each piece of Tuareg jewelry has a special meaning. Combining the different cultures made Forest, the Wakandan Shaman, one that did not represent just one culture. Something that we discussed. "3. To create the accent layer, long beaded front piece was made of tiny beads. The neck piece was crafted out of rope wrapped in leather and joined in the back by magnets. "4. The final layer is are a pair of long red trousers, the 'sokoto'. 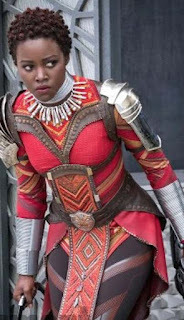 The warrior women known as the Dora Milaje have a distinctive tabard down the front of their uniforms known as "Diviners Belts". They're used for various traditional events. "My first challenge was the long front tabard," Ruth Carter said on her blog. "It started as a simple chevron down the front of the body. I wanted it to have a special reason for being. Be African. And to look like maybe it was passed down to each wearer. If this tabard (attached to the leather harness) was going to be so prominent on this warrior costume, I needed it to be there for a good reason. "African beads were symbols of social status, and extensively used in art and sacred ceremonies to appeal to the spirits. So, I thought, 'protection' 'royalty'. I beaded the entire tabard in the tradition of the Nigerian or Yoruba Diviners belts, then I add something special for each wearer. Towards the bottom of the tabard, there is a crystal, a piece of jade, and a symbolic animal. "For Nakia, it was something from the 'River,' symbolizing her tribe. All a mixing of cultures. And all symbols of protection and personal sacrifice." Shuri and the Dora Milaje have outfits with a prominent collar. Several African tribes use neck coils as part of their look. For example, the Padaung (Kayan Lahwi) women of the Kayan people begin to wear neck coils from as young as age two. While they are worn for various reasons the two main ones are beauty and a sign of marriage. 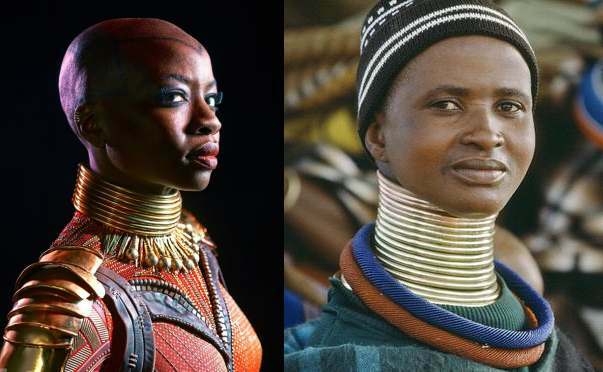 "For the Dora Milaje, I wanted to see Ndebele neck rings in real life and how heavy they were," Carter told The Hollywood Repoerter. "The real neck rings are extremely heavy. So, for the safety of the actors, the neck rings were remade in rubber for filming. 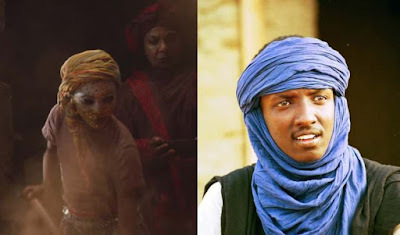 Several characters in the film wear large scarves covering their head and face. These are similar to the ones worn by the Tuareg people. The Tuareg people inhabit an area in North and West Africa. They live in places like the desert and are raising livestock. In the past adult males wore a blue veil in the presence of women, strangers, and in-laws. That's an old practice though. From the South African Zulu tribe to the Igbo people of Nigeria Ruth E. Carter has taken ancient African designs and fused them with the future. It's wonderful to see. What do you think of the designs? Which is your favorite?